A good news is coming directly from the woods. 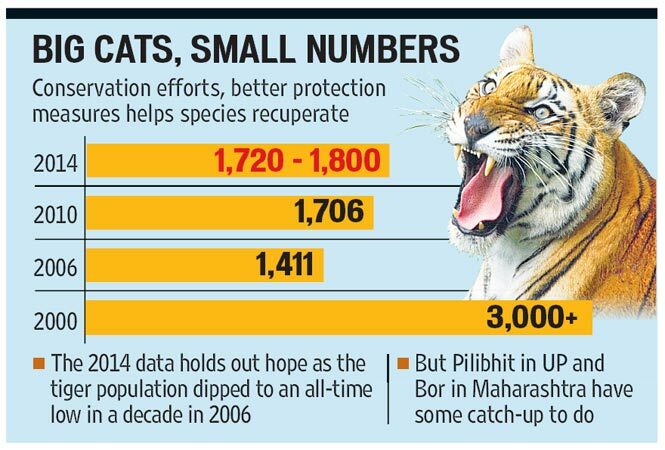 The number of tigers in India has been increased, though the raise being reported is marginal. There were 1706 tigers four years ago, and the figure has reached to somewhere between 1700 and 1800. Relying on a year-long survey, top government officials have corroborated this change in figures. It seems that the efforts to protect big cats have started paying off. The tiger population plunged to 1,411 in 2006 and the Indian government had to introduce a Tiger Task Force and various other initiatives to ensure the survival of this species. Due to the fact that only a few habitats including Corbett National Park in Uttarakhand and Kaziranga National Park in Assam have a good tiger population, the raise between 2006 and 2010 did not reflect uniformly. When it comes to Madhya Pradesh, which was once a famous destination to sight tigers, the population of this species is still worrisome. Other known tiger destinations like Rajasthan and Maharashtra have also witnessed a decline in tiger population in some of their reserves. Tiger census that started in early 2013 in India covers five landscapes, namely Shivalik-Gangetic Plains, Central India and Eastern Ghats, Western Ghats, North-Eastern India and Sunderbans. Apart from current tiger population, the census records useful data about other animals living alongside the big cats. The data is very carefully assembled by installing camera traps, collecting DNA tests & gathering ground reports from thousands of foresters. There are 47 protected areas for tigers and the 10% of current population also lives in other dwellings, which are not in good condition. Thus, the latest report may show decline in tiger population in these dwellings. This 10% is not a small population to not think about and the authorities should come up with some plans if they want to maintain the increase in tiger population.